ေကာင္ေလး ။ ။ ဟူးး.. ဘာေတြလဲကြာ…. ေကာင္မေလး။ ။ ဟလို ဘယ္ေရာက္ေနလဲ ရုပ္ရွင္သြားၾကည့္ရေအာင္ကြာ @#$%&(^%$@#$………………. You received this email because you are subscribed to the real_time feed for http://smsy.mmwordpress.com/?feed=rss2. To change your subscription settings, please log into RSSFWD. You received this email because you are subscribed to the real_time feed for http://seitmeeain.myanmarbloggers.org/feeds/posts/default. To change your subscription settings, please log into RSSFWD. You received this email because you are subscribed to the real_time feed for http://sithu08.blogspot.com/feeds/posts/default. To change your subscription settings, please log into RSSFWD. You received this email because you are subscribed to the real_time feed for http://xinyaw13.blogspot.com/feeds/posts/default. To change your subscription settings, please log into RSSFWD. January 31 marks the 60th anniversary of one of Asia's oldest rebel movements—the Karen National Union (KNU). It is a day commemorated by Karen people all around the world. Since it declared war on the central government in 1949—shortly after Burma declared independence from Great Britain—the KNU has faced a great many ups and downs during its six-decade fight for autonomy. It is undergone rifts and splits, and breakaway Karen groups have emerged. It suffered defeat at the hands of the Burmese army and in 1995 was forced to abandon its jungle fortress at Manerplaw on the Thai- Burmese border. Its aging leadership is fading away while the number of Karen refugees continues to grow. Discontent is high among the Karen population and thousands of families are currently resettling in Western countries under the auspices of the United Nations High Commissioner for Refugee (UNHCR). However, unlike so many other armed insurgent groups, the KNU has steadfastly refused to sign a ceasefire agreement with the Rangoon government. When the KNU's founding father, Saw Ba U Gyi, established the rebel movement in 1949, he unveiled his "Four Principles" of resistance: "There shall be no surrender; The recognition of the Karen State must be completed; We shall retain our arms; and We shall decide our own political destiny." The KNU has locked itself to those principles through thick and thin for 60 years. 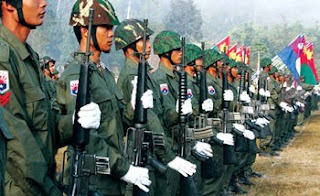 In 1995, the Democratic Karen Buddhist Army (DKBA) split from the KNU and joined forces with the Burmese army. Manerplaw fell soon after. The KNU, led by Gen Bo Mya, scattered while its civilian population joined the exodus into Thai border refugee camps. The KNU lost their only true sources of income: logging and taxation. After fighting the Burmese army for 30 years, KNU commander Tha Mu He and hundreds of his followers surrendered to the regime in April 1997. He told journalists and diplomats that he split from the KNU because of the failed peace talks between the Burmese junta and his mother organization in 1994 and the realization that the conflict would continue indefinitely. Soldiers of the Karen National Liberation Army, the oldest rebel group, stand at parade arms at a base near the Thai-Burmese border. One year later, Phado Aung San, a central executive member of the KNU, and hundreds of his followers also surrendered to the Rangoon government. He gave the same reasons for laying down his weapons as Tha Mu He had. Then in early 2007, another splinter group reached a ceasefire agreement with the Burmese regime. Known as the KNU/ KNLA Peace Council and led by Maj-Gen Htein Maung, it included around 300 defecting KNU soldiers. 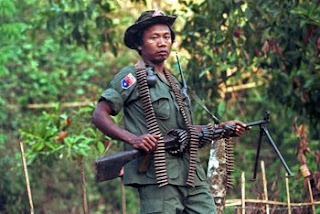 Brig-Gen Johnny, head of KNLA Brigade 7, said that Karen breakaway leaders who had reached ceasefire agreements with the Burmese regime had betrayed their people and their comrades who had died for the Karen revolution. "We have to carry on the unfinished duty for our people. If we give up, it is as if we were betraying our comrades and our leaders who have died for us," said Brig-Gen Johnny. "Our enemy [the Burmese military regime] is trying to divide us every day. We have to be united and always be careful," he said. Meanwhile, the DKBA has boasted that its forces will overrun the KNU's military wing, the KNLA, by 2010. The target of its operation would appear to be Kawkareik Township in southern Karen State, which is rich in gold, teak forest, antimony, zinc and tin. Sources from both the KNU and the DKBA circles have said that the DKBA seeks to control the regions that do business with the Thai authorities. However, the KNU leadership, as always, remains resolute. You received this email because you are subscribed to the real_time feed for http://sawlinux.blogspot.com/feeds/posts/default. To change your subscription settings, please log into RSSFWD.